The two safest ways to invest in the stock market today is by simply investing in low-cost index mutual funds and/or commission-free index exchange-traded funds (ETFs). In the past, the only way to invest in a fund that contain many assets was through actively managed mutual funds. Mutual funds were pricey and still are today. Now, thanks to index funds and ETFs, it’s much cheaper for investors because you’re not paying the ridiculous management fees. Here’s why index funds are great, at least why I think they are. Many of the reason I list also relate to ETFs (which are pretty cool too). When you buy an index fund you’re ultimately investing in a huge portion of the market. This gives you a ton of diversification. An Index fund includes every stock in its asset class. So if a couple of stocks start to tank, you’ll balance out with the other stocks. On like mutual funds, that pay a staff to constantly monitor, research, and buy and sell stocks within the mutual fund, which in turn charge investors higher fees. Index funds require no staff to monitor them because they mimic the entire market, which in turn benefits the investor, by charging on average only one-tenth of what mutual funds charge. When you by an index fund, you know exactly what you’re investing your money in. The only thing managers of an index fund has to do is mimic the index. Whereas with mutual funds, which are actively managed, they’re continuously buying and selling shares in the fund and taking gambles on stocks they believe will perform well. Index funds historically have above-average returns. Also, historically over a 10-year period index funds always out-perform mutual funds. Index funds are cheap to maintain. The only thing the managers have to do is mimic the market or index. This makes investors lives easier because they don’t have to constantly monitor how the fund is being managed as they would with a mutual fund. 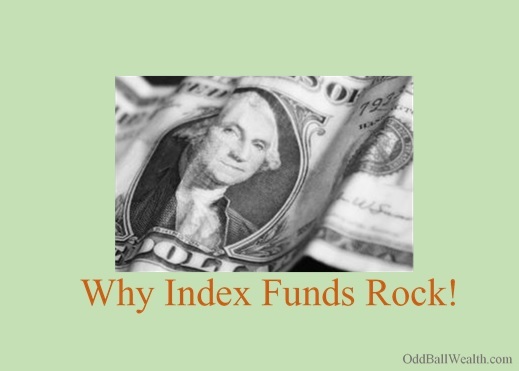 Index funds simple to pick. You just choose the asset class you want your index fund to be in, and then you’re done. Actively managed mutual funds have been known to keep up to 10% of the portfolio in cash. Mutual funds have to keep cash on hand for market shifts when investors decide to pull out of the market, and to have the buying power to buy new stocks. Having money just sitting in cash costs investors’ money. Index funds do not keep cash idle, they have no reason to. Index funds are tax-efficient, unlike mutual funds. Index funds not constantly buying and selling stocks. Actively managed mutual funds are always buying and selling shares, and each time they sell a stock for a profit it increases the investor’s tax burden.